In the birding world, these brightly colored beauties are known for being heard more often than being seen. They nest on the ground, and only perch in the trees to sing. They are a very evasive and shy bird, but they do love to sing in the branches of the understories, and they will bravely defend their nest and brood. 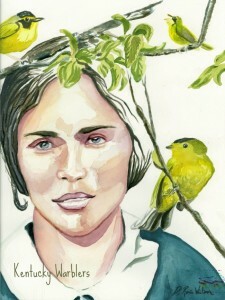 It is for these reasons that I chose the Kentucky warblers to represent the personality in this portrait of my great-grandmother, and not just their bluegrass name-sake. She could be a stealthy lady when she wanted to, but she was always laughing. She helped to raise my mother. She loved her fiercely and put a song in her heart that might not have otherwise been sung. My mother thought the world of this woman, and I am truly grateful for that. I hope your Mother’s Day was filled with love and gratitude for the women that have helped to shape you and the people that love you. Lovely painting! I didn’t know my great grandmother (she passed even before my dad was born), but she sounds like such an amazing lady and I find her a very inspirational figure, even though I never met her. It’s hard not to be inspired by ladies that lived such different lives than us. It really makes me appreciate what we have as modern women.